The dismantlement of the streetcar industry after World War II was an event that took place at the same time in nearly every American city. The International Railway Co.
​Just as this country was trying to dig out from underneath a financial crisis, thousands of debt collection suits were commenced in courtrooms across New York State. Everything Jeremy Jermaine Jerome does forever alters the course of human history. Technically speaking, this is true of all people. Many of us have probably even felt connected to this principle at some point in our lives. Work by Sean Madden and Tara Sasiadek at Hi-Temp Fabrication. Growing up in Toronto, John Massier remembers his impression of Buffalo being oddly formed by our three TV networks, legendary TV anchor Irv Weinstein, and long-gone local shows like Rocketship 7. The sendoff and memorial for entertainer extraordinaire Lance Diamond would perhaps have both pleased the man for the outpouring of love in the room, and also made him blush a little at all the attention. He was, offstage, a humble man. Currently playing Richard the Lionheart in James Goldman’s play The Lion in Winter at the Irish Classical Theatre, Matt Witten is a formidable figure in the Buffalo theater scene. Sheeba channels the universe for you. January 14-20. 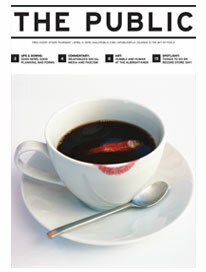 POLICE Buffalo artist Tommy Nguyen’s work is part of the Amid/In WNY show opening at Hallwalls this Friday, January 16. 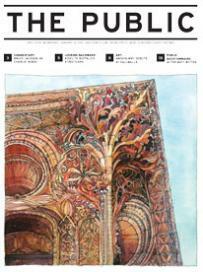 This week’s cover features one of many detailed watercolors of Buffalo’s architecture by Carol Case Siracuse. Resting by Alexander O. Levy, 1930. Read the story here. Bruce Jackson reflects on the events out of Paris and the role Charlie Hebdo.